Natural products have been evolved by nature over thousands of years to perform very specific biological functions. For example, they can induce gene expression, inhibit ribozyme function, and control protein dimerization. 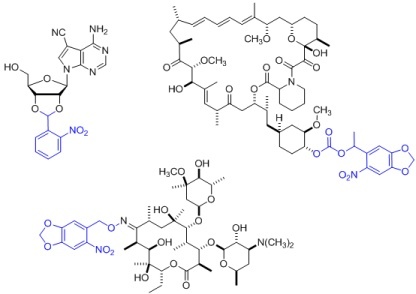 In order to allow for optochemical control over these biological processes, we have developed synthetic routes to several natural products that are site-specifically modified with caging groups. Examples include caged toyocamycin, caged erythromycin, and caged rapamycin.